Carma Carpooling isn’t like traditional carpool technology that makes people plan days or weeks in advance. Instead, everything is done in real-time, right when it’s needed, right now. The Carma app (car.ma) allows commuters to search for other users going their direction and create a real-time carpool. Later, they can choose to make the return trip with the same person or make a brand new real-time carpool with someone else. Using Carma, riders and drivers share the cost of commuting through an automated micro-payment transaction based on the distance of the trip taken. Once the rider has been dropped off, $1 plus $0.20 per mile traveled will be deducted from the rider’s Carma Carpooling account and 85% of that will be credited to the driver (capped at $0.55/mile). This makes payment safe, secure and fair. After each trip, the rider and driver are prompted to rate each other out of 5 stars and to leave a review of the trip. When choosing who to rideshare with, users click into each other’s profile to see their star rating, groups, verifications and the number of times they have been rated beside their name and profile picture. Live in Sonoma, Marin or Contra Costa? You’re going to love this! There’s been some confusion recently, as a number of apps for hailing taxicab-like services have been making news as they are being prosecuted for violation of local and state laws on commercial transport services (such as Uber, Lyft, etc). So, why does Carma come under the new definition of ridesharing, and these companies do not? These peer-to-peer taxi services take regular people with regular cars and convert them into neo-taxi drivers, picking people up wherever they are, taking them wherever they want, at rates competitive to taxi services. 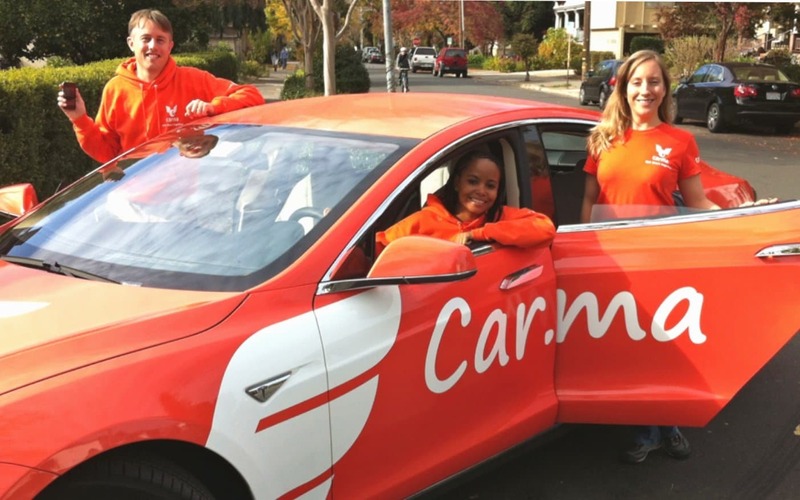 Carma drivers offer rides to people along the route they already plan to travel. The driver would take this trip anyway and brings a rider along to share the cost, use the HOV lane, or just enjoy some company. Secondly, the charge to the rider is well below the commercial rates charged by peer-to-peer taxi services (compare a one mile Sidecar or Lyft trip in San Francisco at $9 to $1 with Carma for the same distance). Additionally, the Carma driver never receives more than $0.55/mile, which is below the IRS travel reimbursement rate. Carma SFBay is part of the Metropolitan Transportation Commission’s Climate Initiatives Program. The Climate Protection Campaign is implementing the pilot in Sonoma County in partnership with the Sonoma County Transportation Authority and the software provider, Carma. The Transportation Authority of Marin and Contra Contra Costa Transportation Authority is responsible for the pilot in their respective counties.